When a large number of clients run interactive Web applications, many of these sessions may be idle at a given time. The connection pooling feature enables the database server to timeout an idle session and use the connection to service an active session. The idle logical session remains open, and the physical connection is automatically reestablished when the next request comes from that session. Therefore, Web applications can allow larger numbers of concurrent users to be accommodated with existing hardware. 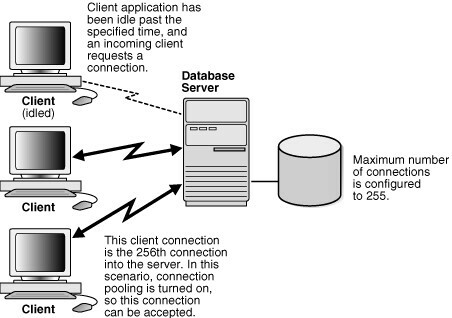 In the below example, the Oracle Database server has been configured with 255 connections. One of the clients has been idle past a specified amount of time. Connection pooling makes this connection available to an incoming client connection, which is connection number 256. When the idle client has more work to do, the connection is reestablished for that client with another client's idle connection.